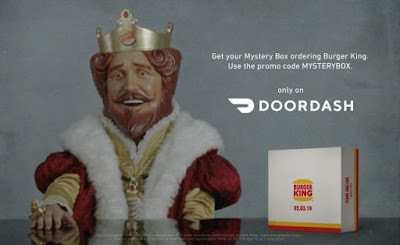 If you like surprises, Burger King is mailing Mystery Boxes to customers who place a DoorDash delivery order of $10 or more with their local participating Burger King restaurant through Monday, February 4, 2019. To get your box, you'll need to enter the code "MYSTERYBOX" when ordering. The boxes will be available while supplies last. DoorDash is also offering zero delivery fees on Burger King orders of $10 or more through February 4, 2019. The promotion comes as the fast food burger chain teases its first Super Bowl commercial in 13 years. According to the fine print, the Mystery Box contents may vary but will be valued at about $30 and should arrive at your home via FedEx within 7 to 10 days of placing your order.